Consisted of dangerous rapids and current, Xiling Gorge starts at Badong County zigzagging for seventy six kilometers (forty seven mile) down to the Nanjin Pass in Yichang. It is the longest part of the Three Gorges with torrent like Xietan, Qintan and Kongling, collectively known as the Three Rapids of Xiling. Firstly, the first rapid in Xiling Gorge - New Rapid (Xin Tan) rushes over submerged rocks, the oily surface of the water churned by whirlpools. The swift current carried boats downriver through Xin Tan at the rate of seven meters (thirty feet) per second. It is really an adventure. The four-kilometer long Military Books and Precious Sword Gorge (Bingshu Baojian Xia) is the first spot at the western entrance of Xiling Xia. The name of the gorge refers to a stratified layer of rock resembling a stack of books, and a perpendicular rock shaft below it, at a small cave on the north bank. Rice Granary Gorge ( Micang Xia) stands at the mouth a ravine on the south side. Blown by river winds, fine sand piles up on the rock, and slowly leaks through a hole underneath so called Micang. Further on, Qintan Rapid, stretched between "Military Books and Precious Sword Gorge " and " Ox Liver and Horse Lungs Gorge", including First Rapid, Second Rapid and Third Rapid, runs 1.5 kilometers from west to east, teeming with reefs and convulsed with sweeping, boisterous rapids. Sailors called it "Iron Threshold" to the river. Boats and skiffs used to shoot downstream like flying arrows and flounder upstream as if scaling a ladder, zigzagging their way either up or down. The channel winds east and then south, towards Ox Liver and Horse Lungs Gorge, which named after the yellow stalactite formations on the north side. One of the ‘Horse‘s Lungs‘ is missing during the war battle. Kongling Rapid lies in the Miaohe section. The local people have always said: "Qintan and Xietan are not real rapids compared with Kongling Rapid - the worst of the Yangtze rapid." 24 reefs, named Great Pearl, First Pearl, Second Pearl, Third Pearl, etc., are crammed in the rapid, bulging into each other‘s way. The Great Rapid, for example, sprawls in the middle of the river, dividing the water into two channels: the south channel full of jagged reefs and fickle eddies and the north narrow, twisted and forbidding with submerged rocks. Besides, there was a hideous reef called "Coming-at-Me", which used to fill people with fear. This is a rapid where passing boats had to thread their way through the reefs, dodging from side to side all the times. 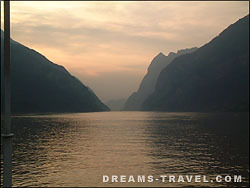 Sailing down about 5 kilometers past Qintan Rapid is Ox Liver and Horse Lungs Gorge. Many other scenic spots composed in Xiling Gorge, are "Lantern Shadow Gorge", "Huangling Temple", "Three Travelers‘ Cave", "Horse Bell Rock", Mt. Qingshi (Black Lion) in Shipai Town, Three Swords Peak at Nantuo, etc. There are also many waterfalls. During the rainy season, the Jiuwanxi Waterfall roars with its gushing water. At the foot of the Heavenly Pillar Peak, there is a stalactite Huangsang Cave, over with spans a natural stone bridge known as the Fairy Bridge, covered with creeping plant growth. On one end of this bridge stands a statue of a fairy. It is truly wonderful to look down at the boats shuttling to and from this point.